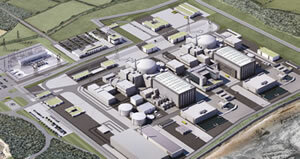 In recent weeks, the government has given the final ‘green light’ for Hinkley Point to become the home of Britain’s first nuclear power station for a generation. The energy giants EDF, along with significant financial backing from China, are heading up the finances for the huge £16bn price tag which the nuclear power station project boasts. The launching of this major development, which has been scheduled to open in 10 years’ time, has revealed some spectacular statistics. During construction it will employ a total of 25,000 people, with 5,500 at its peak stage. Once the project is complete, the UK’s energy network will reap the hard earned benefits. 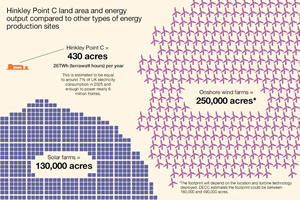 For example, the Hinkley Point C’s 430 acre site, will generate 26TWh (terrawatt hours) per year, which is enough to power 6 million homes. In comparison, this would take 130,000 acres of solar farms or around 250,000 acres of onshore wind farms to generate that volume of energy. The diagram below illustrates some more remarkable facts and figures as a result of the government’s approval. This project is opening up a massive window of opportunity for Armorgard products. With our wide product range spanning from secure tool storage, compliant hazardous storage, and materials handling, the Armorgard team anticipate working with our distributors to provide numerous solutions throughout each stage of the construction process. Here at Armorgard, November 1st is the launch date for our new design Gorilla Gas Cage. Keeping ourselves and your product range ahead of the industry, we are introducing a unique range of. Armorgard recently exhibited at the Executive Hire Show in the Ricoh Arena, Coventry, on 12th and 13th February 2014. Being a show for innovative suppliers to meet with passionate hirers, it.